A color wheel chart can tell you how colors relate to each other, which ones might work together and which ones probably won't. But use it with caution, particularly in decorating and design - there's more to the color mixing wheel than mixing primary colors. You'll find all the basics in these color theory articles! 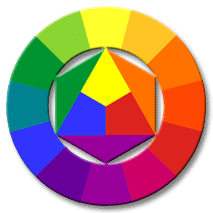 The artist's color wheel is the color mixing chart we all learn at school. It was developed by painters for painters from the 18th century onward. It is about mixing paint colors from 3 primary colors. Also, even though it's called an 'artist' color wheel, it won't necessarily help you pick great color combinations, because color combining doesn't follow the same rules as color mixing. The three basic, primary colors are yellow, red, and blue. In theory, you can mix absolutely any color from this initial set. ♦ red and yellow produce orange. Each pair complement (='complete') each other to produce a neutral color. and your three primaries reunite before your eyes to the old murky gray. These mixtures are sometimes called 'tertiary' colors, but the term is not used in the same way everywhere. When you align the 3 primary colors with the secondary and 'tertiary' colors around the outer ring of the color wheel chart, the complementary pairs always sit directly opposite each other on the outer ring. Hue, tint, shade & tone, and all the other color terms? Triadic & tetradic color schemes? And are there really only 3 Primary Colors? 1 A color wheel chart is about how we see or mix colors. It is not a model of how colors should be combined. So don't sweat it - there's no such thing as a "correct" color scheme! However, do check out some great color combinations here, and lovely examples of bedroom color palettes here. In real life, most colors are not brights - they've been dulled down by admixtures of neutral colors like gray, black and brown. The color wheel does not include brown. The color brown consists of black plus a mix of several primary and secondary colors; it sinmply can't be 'mapped' onto the color wheel chart because it is too complex for this model. However, brown is also one of the most-used decorating colors, and as an interior designer, you need to see the colors that are 'hidden' in brown & other neutrals. Find out more about this in my FREE e-book, Stylish Neutrals! Free Printable Color Wheel templates for use in your classroom or studies (or in case you need some online color wheel pictures). d) blank color wheel templates for your own color mixing experiments. If you're looking for an online color wheel that is not about mixing primary colors, try Ewald Hering's 4-Primary Color Wheel. it has a rather gorgeous set of 'opposing' colors that make good decorating color schemes. The 'interior decorating' color wheel you can buy in paint supply stores is usually just a Basic Color Wheel for mixing colors. It's a painters' color wheel rather than a design color wheel: It shows how to mix paint colors, not how to combine them successfully. However, it does explain useful basic color terms like 'hue', 'tint', 'shade', 'tone', 'monochromatic', 'analogous', 'complementary', 'triadic', and so on. Knowing Basic Color Theory is extremely valuable, no matter whether you're designing a room color scheme or 'just' wrapping a present. Here's an illustrated list of 15 useful color terms. How to manipulate color schemes so they look great. Where are the Complementary Colors on the color wheel chart? What can you do with them? And what do split complementary colors look like? Oh, and why is 'complementary' the correct spelling? 4 complementary (and complimentary ;-) room color scheme ideas. 3 Primary Colors are sufficient for mixing all paint colors (at least in theory). So they make a good starting point for a paint color mixing chart - but are they sufficient for other jobs as well? Not if you work in the paint industry, or design contemporary logos. So how many primary colors do we actually need? They can vary from extremely purist combinations (one hue plus the non-colors black & white) to almost analogous color schemes (say, a variety of bluish greens and greenish blues). The article takes one room through several monochromatic color schemes - see how it works! 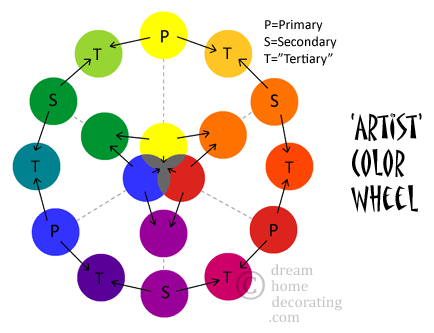 Return from Color Wheel Chart to the Dream Home Decorating homepage.